In this episode of Tripawd Talk Radio, you’ll learn what’s so special about medicinal mushroom supplements for dog cancer, from expert Dr. John Holliday, president of Aloha Medicinals and creator of immune support supplements including K9 Immunity. You will learn how medicinal mushrooms work and how dogs with cancer can benefit from the ingredients in products like K9 Immunity. Dr. Holliday will share his tips for using supplements safely and effectively when fighting cancer. Also in this episode: learn how one special Basset Hound named Rosie defied all odds and beat advanced stage cancer after beginning a K9 Immunity regimen. Her Mom Dorla will discuss how she discovered these medicinal mushrooms and what kind of effects they had on Rosie’s life. Dorla will share her own personal tips for coping with canine cancer through the use of medicinal mushrooms and discuss how she turned a devastating diagnosis into a positive way to help other pet parents through the company she founded in Rosie’s honor, K9 Medicinals. 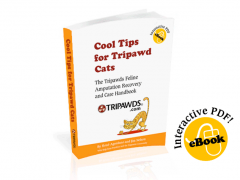 This post is sponsored by K9 Immunity and Tripawds.com, with compensation for helping to spread the word about K9 Immunity. 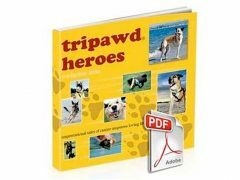 Tripawds only shares information we feel is relevant to our readers. K9 Medicinals and Aloha Medicinals are not responsible for the content of this article. I so wish I had learned about these products much sooner and started my Polly on them…..I sometimes feel like I failed her, when I maybe could have helped her, instead of dragging my feet and just hoping for a miracle…. I am so glad for this great community and what I have learned here, and when I have to battle cancer with Pearl, (it’s inevitable, with her being a Lab) I hope there are more strides in cancer research for pups, and I will get a jump on it quickly for her and maybe, actually kick this crappy disease for her. There’s a lot of infor online about holistic/natural cancer treatments. I’ve been fighting a very aggressive cancer, oral squamous cell carcinome, that is located way in the back of the mouth of my 16 year old cat. I’ve been using holistic/natural treatment since the end of April, 2014, which is about seven months now. She’s done better since I swtiched to doing this myself using natural/holistic methods. Conventional medicine has very little to offer for this kind of cancer and give less than a one year survival rate no matter how aggressively it’s treated. Well, we’ve passed the one year mark and I’ve still got my kitty. At her age, I know she’s on borrowed time, but I am thankful for every day we have together. If you find yourself doing battle with cancer again, check out what holistic medicine has to offer right from the beginning, especially if it’s a cancer that conventional medicine gives little hope for being able to do much about. If I hadn’t gotten off the beaten path, I don’t believe that I’d still have my kitty using conventional medicine alone.